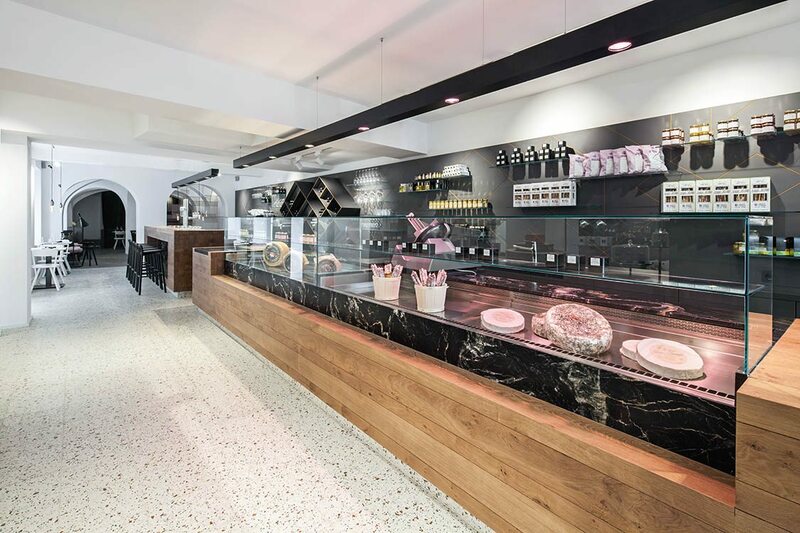 The foodies of Vienna are in a veritable cheese heaven now that one of their own, Johannes Lingenhel, has opened his first-ever Käserei – a delectable combination of a cheese factory, tasting bar and gourmet boutique. 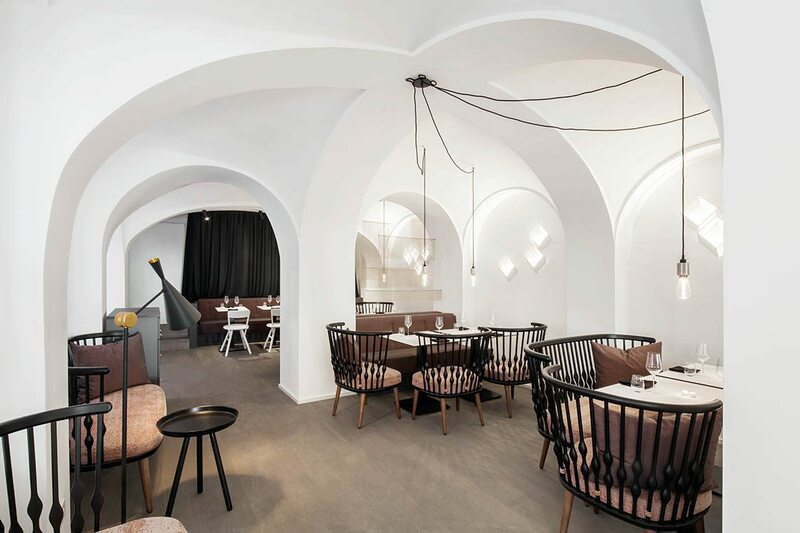 The beautiful shop, designed by Vienna-based Destilat Architecture + Design is located at Landstraßer Hauptstraße 74 in one of Vienna’s best shopping areas in the 3rd District. Even more intriguing, the store is housed in the heritage-listed 220-year-old residence of Baroness Marie von Ebner-Eschenbach who is considered to be one of the most important German-language writers of the late 19th century. The Viennese know Lingenhel from his many other food ventures, including the long-time gourmet stall, Pöhl am Naschmarkt, he and partner Christian Poehl operated in the huge, hip and popular Naschmarkt market. But this is his first ‘real’ store and he has not been timid with it. 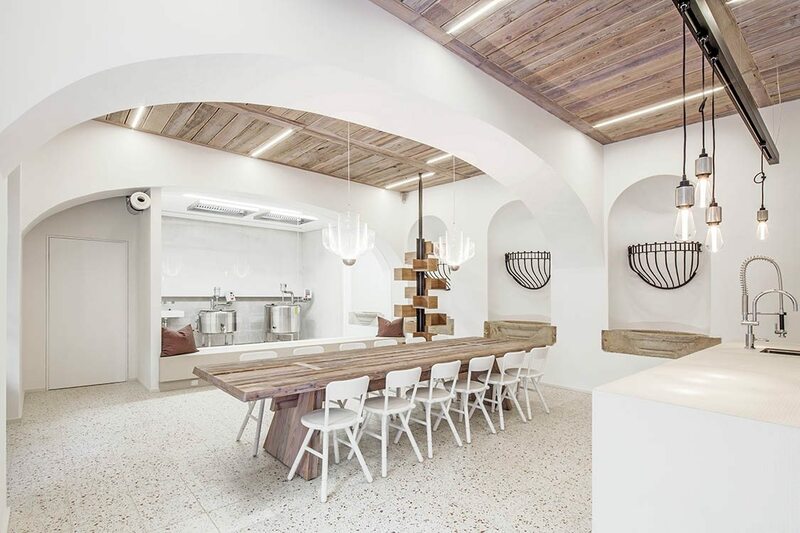 The entire establishment is both a working cheese factory as well as a gourmet tasting bar and the interior is magnificently minimalist and opulent. The cheese factory itself is located in the former stables of the residence. For hygiene reasons, the adjoining tasting room is separated from the dairy area with a glass wall, but the glass provides a cool window into the fascinating world of sterile cheese making. 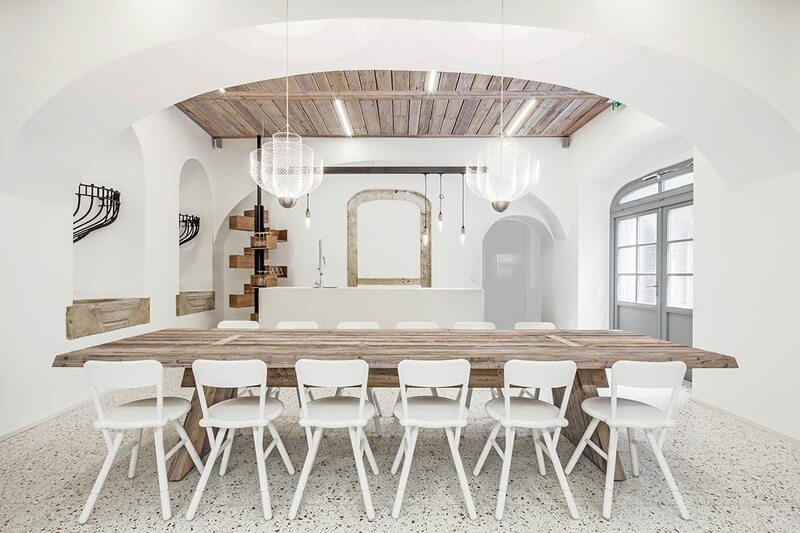 The patina of time is celebrated in the wood beams, butchers-block counters, marble accents and horses’ drinking trough. And, although not all of the materials are old, they have the appearance of patina and they will age beautifully with constant use. The plain cast-iron accents, the cool light fixtures and the minimalist color palette give the shop its sense of timeless yet modern charm. 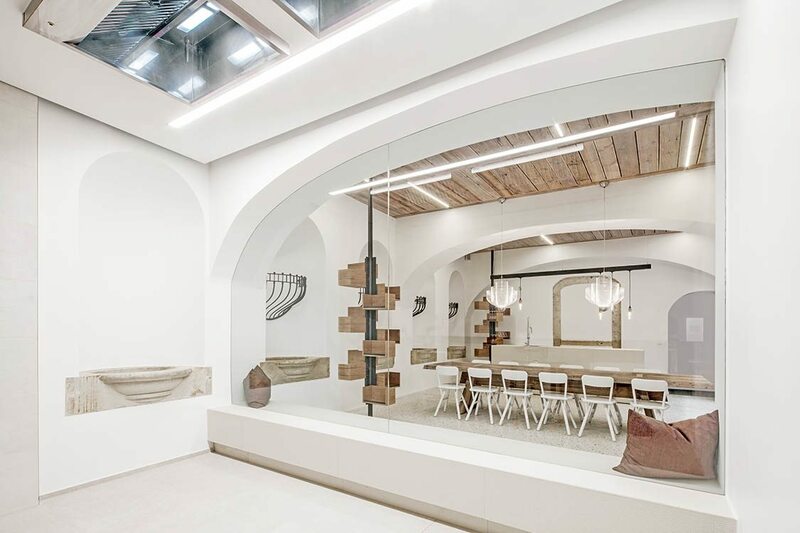 Our favorite aspects of this project are the curved form that repeats in the cast-iron accents, lighting, seating as well as the arched entryways and windows, and the wood ceiling that demands attention and draws the eye up. The in-house cheese makers will produce, for example, buffalo and goat’s milk specialties including brie, camembert and mozzarella. 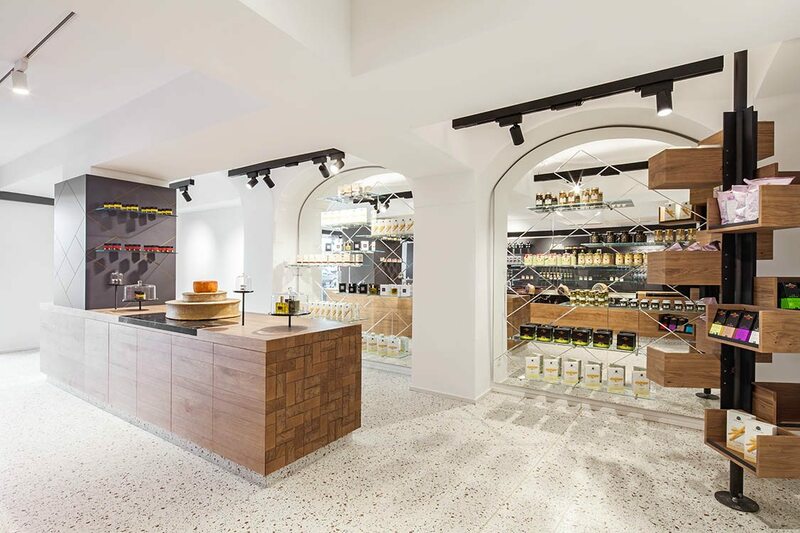 The Lingenhel boutique also carries other delicacies such as prosciutto ham, preserves, breads and olive oil. – Tuija Seipell.